As members of the Office of Disease Prevention and Health Promotion (ODPHP) health literacy team, we are committed to promoting the use of health literacy principles. 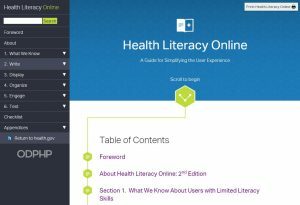 We recently took a deep dive into the online user experience to write the second edition of Health Literacy Online: A Guide to Simplifying the User Experience, and are honored to have been recognized with a Clear Mark Award for our efforts. We learned a lot about the challenges many people face using health websites. We wanted to share some lessons we learned with those of you who are involved in creating online health content—writers and editors, content managers, digital strategists, user experience strategists, web designers, developers, and other public health communication professionals. Make websites responsive. Today’s users expect websites to work well on every screen they touch—whether it’s a mobile phone, a tablet, a desktop computer, or other interfaces we haven’t thought of yet. Start with mobile in mind. More and more users, especially low-literacy users, are accessing the web from mobile devices. Shrinking the space you have to work with at the start helps prioritize what and how you present information, while making sure the mobile experience is a simple one. Write actionable content. Most web users—including those with limited literacy skills—are looking for specific information or an answer to a question. They typically don’t stay on a page for more than 15 seconds. Have users test your site with their own phones. Users are accustomed to how their smartphone or tablet is set up. When conducting usability testing you will get more accurate information if users test your site on a device they’re familiar with. Use visual cues to indicate change. Show that the graphic or tool on your site has changed with visual cues. If users can’t see changes, they’ll assume the graphic or tool isn’t working, creating frustration. Use visual cues to indicate change—the more obvious, the better. In addition to the tips mentioned in this blog post, the Guide is filled with very practical recommendations. Some of them come from the literature related to the cognitive processing and online behavior of adults with limited literacy skills. But many of the recommendations come from web users themselves. The Guide follows one of the most important health literacy principles; involve users in the development process. We spent time observing and interviewing more than 800 users at their computers and mobile phones, many of whom have limited literacy and limited health literacy. They helped us think out of the box of our own online experiences and brought health literacy and usability principles to life. As a result, the Guide offers dozens of recommendations and practical steps to implement them. We hope you find the Guide useful. 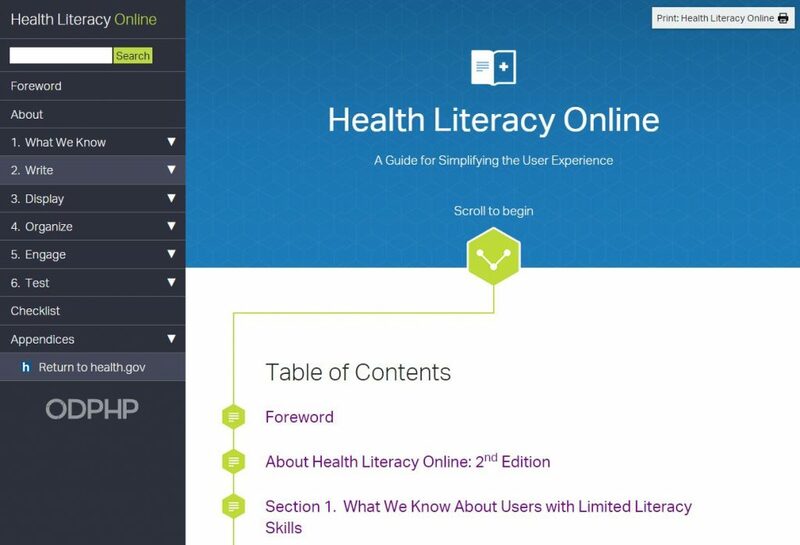 The first edition of the guide helped bring health literacy principles to several award winning health websites. We hope the second edition of the guide helps your website achieve similar accolades through the use of health literacy principles. About the Authors: The Health Communication and eHealth team at ODPHP is dedicated to helping professionals communicate more clearly with consumers. They create, promote, and curate evidence-based health literacy and communication tools, practices, and research.